Sunflower oil is light, easily absorbed by the skin and rich in fatty acids and vitamins - especially vitamin E. It is also a great source for beta carotene, which converts into vitamin A, which in turn has fabulous antioxidant properties - great for your overall health and your skin health too. It is wonderful for all skin types, especially mature, sensitive and dry, damaged skin. 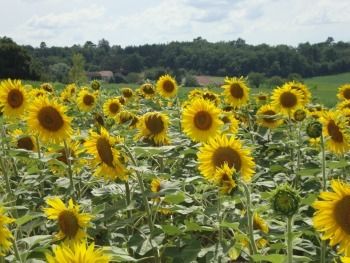 Sunflower is a good carrier oil to use, as part of a blend, for both body and facial massage. It is a moisturising oil that leaves your skin feeling soft and supple.....plus its antioxidant properties help keep wrinkles at bay! This oil is extracted from the seeds of the flower which makes it ideal to use with people who may suffer from nut allergies. Because of its numerous health benefits and the fact that it is inexpensive to buy, it is often included in soaps, lotions, creams and moisturisers. I often use it as part of an oil blend when formulating my natural skincare products. Clear pale amber with thin viscosity and a faintly sweet, light aroma. Includes lots of minerals and vitamins including A, B C D and E.
It helps with skin injuries and healing wounds. It is good for after sun care as it neutralizes free radicals that penetrate into the skin. This oil can help alleviate bruising. This oil moisturises your skin without making it look oily. This oil is very beneficial for your hair. Excellent for aromatherapy massage, blend 15 drops of your favourite essential oils with 15ml sunflower oil and 15ml sweet almond oil, and massage onto your body.......simple! For healthy, shiny hair, massage the oil into your scalp and comb it through your hair. Then wrap it up with a towel and leave for at least an hour - you can leave it overnight. Rinse your hair out thoroughly afterwards. Why not make a natural body scrub with sunflower oil and sugar - mix 1 cup of oil with 2 cups of sugar and scrub your body whilst in the bath or shower using massaging circles. Wash off with water. Inexpensive with a shelf-life of about 12 months.